Monday night is local night in the Entry, highlighting some talent from three Twin Cities artists with a lot of potential. Northeast group The Paper Days will be performing songs such as their debut single “Northern Sky” which highlights the band’s three songwriters and their acoustics, performing sounds that should be familiar to local acts such as Trampled By Turtles or Pert Near Sandstone. Joining them will be brothers Sean and Shannon Heier as Small Town Anthem. Their debut album from 2011 still holds up over time, and these Redwood Falls boys will be rocking out with their roots rock sound in their 7th St Entry return. Veteran group Old Desert Road will cap the night off with their beautiful acoustic storytelling that is accompanied by irresistible violin harmonies by groupmember Jennifer Peterson. Don’t miss out this Monday night, catch some warm local jams at the first December show in the Entry this year! With the skilled lyricism of ASAP and Chance, but with beats that could standalone, we present to you, Major G. He will be hosting his Kingdom Hearts release party this Tuesday night in the Entry. His unique approach to music is noted within a few seconds of any of his tracks. He has no problems with heavy voice modification, not referring to auto-tune, but you’ll have to listen for yourself to truly appreciate its glory. He has been working on his music relentlessly in the past few years hoping to break out big into the hip-hop world, and hopefully more people throughout the world will know about this budding avant-garde hip-hop artist before long. Here’s your chance see to see him on the small stage. 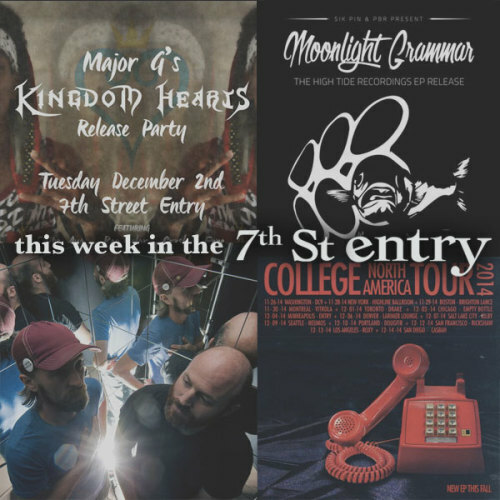 Hip-hop fans should be excited for the fact that the next night at 7th St will be another release party, featuring local rapper Moonlight Grammar slinging lines from his newest EP, The High Tide Recordings. His wordplay and lyricism are next to none for local work, and scattered throughout are Prince references, political quotes, and always brilliant synth work. His lyrics and beats make it apparent of his experience in the field. Surely not a show to be missed this Wednesday. Hailing from Paris, France, David Grellier is the one-man machine behind College. Inspired heavily by Jeff Mills and Aphex Twin, he was instantly drawn to computer-driven synths and his talent has grown exponentially since beginning the trade, starting his own label, Valerie. The same year his first album was released was the inception of his label. His track “A Real Hero” was selected as the theme song behind the excellent film, Drive, a movie known for its brilliant soundtrack. His work with Electric Youth is particularly acclaimed, being known in the past few years for fostering some of the best electronica out of Paris. His newest release, Heritage is one of the more acclaimed albums to be released in 2013. As opposed to checking him out at a large festival, why not stop by the Entry this Thursday and see him in our most intimate venue. This is the third of an ongoing series of songwriter nights featuring some of the best that the Twin Cities has in it's deep pool. Friday features 6 songwriters all performing 5 songs. The theme of the night is "Ice". Each writer will be debuting a song written specifically for this show and using "Ice" in it's narrative. There will be room for possible guests / collaborations as well. Embrace the night. With the Def Kith EP, the usually mononymous Martin Dosh and Jon "Ghostband" Davis debut their techno-addled, IDM-damaged brand of bass-blessed dance music. Across these three or four cuts we hear two "one-man-band" types becoming a single collective. It’s the rhythm section’s revenge as the respective drums and bass of countless jazz and odd-rock ensembles put their improvisatory chops to work, funneling a lifetime of musical obsessions into their live electronica, inspired by a number of famous digital musicians, yet still holding a strong Minnesota influence with Dosh’s superb drumwork. A nonstop dance party for mind and body alike!